Still regarded with affection in the popular imagination, the Druids, at the height of their power in Celtic Britain, were known for their love of nature and worshipping heros and ancestors. Signs of their renown are still clearly marked: in guidebooks, place-names of the countryside, and most visibly, in such structures as Stonehenge. 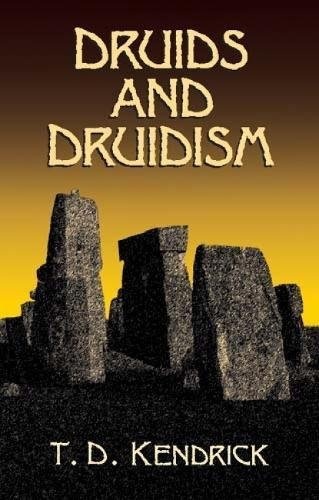 T. D. Kendrick — widely cited in many studies of druids and druidism — presents a well-documented summary of druidic culture, offering a detailed account of the racial history, prehistory, and social atmosphere of early Gallic and British civilization. Amply illustrated with rare maps, jewelry, pottery, wall carvings, stone inscriptions, timeworn foundations and burial grounds, the text considers the many theories of the origin of Druidism, its early mention by Greek and Roman writers (ca. 52 B.C. ), and the temples and religious practices of these ancient people. A thorough study of a fascinating topic, this book will appeal to anthropologists, folklore enthusiasts, and anyone interested in the early religious and cultural life of Celtic Britain.